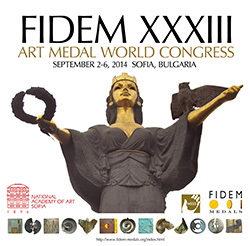 The XXXIII FIDEM congress was held in Sofia, Bulgaria. 130 particpants enjoyed a few days of medallic art. The program was filled and very interesting. Meetings and lectures were held. One could enjoy a workshop and several medal exhibition openings. Old faces and new faces meet and the discussions were all revolving around medals. The official congress medal is designed by Prof. Bogomil Nikolov. 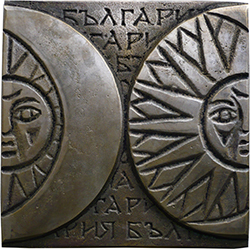 The main elements of the obverse are the sun and the moon which are often found on the medieval Bulgarian stone reliefs and Bulgarian renaissance stamps. On the background of the obverse and reverse is written with old Slavonic letters: Bugaria. More pictures from the congress taken by Mr Bob Autrique (Belgian member) can be found by clicking on the following link: http://www.bobautrique.phanfare.com/6662651.